It’s Gay Pride month in New York, and even the free Playbill programmes given out at every Broadway theatre have turned rainbow coloured in its honour. This is both particularly poignant and appropriate for the first-ever Broadway outing of Mart Crowley’s play on the 50th anniversary of its original pre-Stonewall premiere, an event that would change gay life in North America forever. But it also marks the theatre’s early tentative steps towards portraying its community both unashamedly and also self-critically. In a Broadway year that has also seen the return of Tony Kushner’s Angels in America, it bookends where we’ve come from and travelled towards, while Matthew Lopez’s recent The Inheritance continues to chart the post-Aids legacy to the present day. “Show me a happy homosexual and I’ll show you a gay corpse,” says one character in the party scene that unravels disastrously among a group of New York friends being held to celebrate a birthday. But for all the internalised homophobia and self-loathing openly on display, Crowley’s achievement is to humanise each character amid the bitchy banter to reveal layers of feeling and friendship. 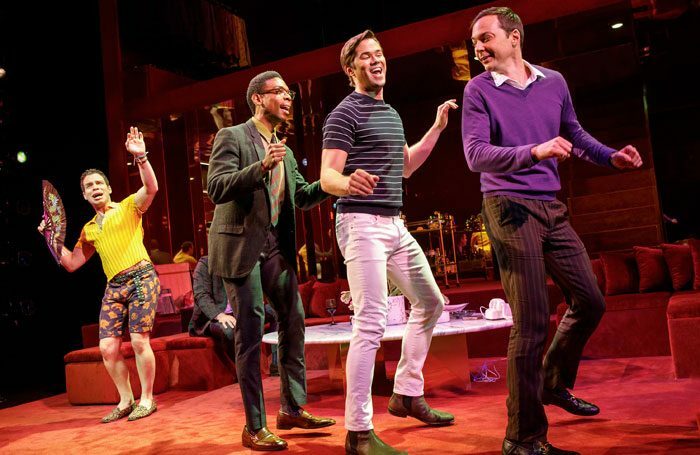 The all-star (and, as it happens, fully gay) cast of Joe Mantello’s production lend it an unaffected honesty and authenticity, with Jim Parsons as party host Michael and Zachary Quinto as birthday boy Harold both bringing waspish wit and expert comic timing to the stage. But the ensemble cast also has finely calibrated contributions from Matt Bomer as regular weekend visitor Donald, Andrew Rannells and Tue Watkins as a couple grappling with conflicting needs, and Robin de Jesus as the flamboyantly funny Emory. Designer David Zinn frames them in a glass box of an apartment that’s a bit like a fish tank in which we can watch as they variously banter and confront each other and their demons; while Brian Hutchison is superb as the fish-out-of-water visitor who may have a gay past of his own.